Legend of the Sydney bar scene, James Irvine, has taken our the title of BACARDÍ Legacy Australia Cocktail Competition Champion for 2018. The beverage director for Swillhouse Group battled it out against fellow competitors Vini Wang, of Adelaide’s Hains & Co., and Zachary Mynott, of Brisbane’s Canvas, on stage at Sydney’s Eternity Playhouse in front of a packed audience of industry professionals and peers. Each competitor was required to recreate and present their bespoke BACARDÍ Legacy cocktail before the three expert judges, Jason Williams, Fred Siggins and Dave Kerr. The judges awarded based on ingredients, ability of the drink to be recreated around the world, presentation skills and the success of the competitor’s three month marketing campaign of the cocktail. In the end, Irvine’s ‘Bocado’ – a drink which plays homage to every person who contributes to a successful bar, including bartenders, bar backs, designers and consumers – won the judges over. 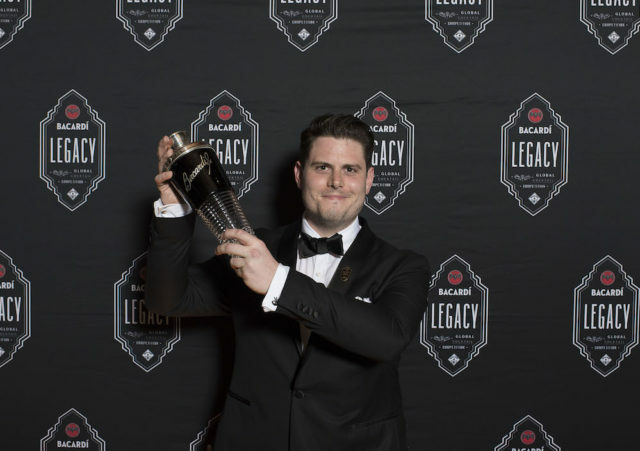 Irvine’s prize consisted of $5,000 AUD and the opportunity to represent Australia at the BACARDÍ Legacy Global Finals held in Mexico City in April. “It’s a great honour to be representing this country in April, and I hope I do you all proud,” said Irvine. Those interested in trying Jame’s winning drink, Bocado, will be able to do so from select bars around the country in March. Method: Stir all ingredients (except the rosemary oil) in a mixing glass filled 3/4 full of quality ice. Once chilled and diluted, strain into a chilled cocktail glass with a single, dense (preferably spherical) piece of ice.